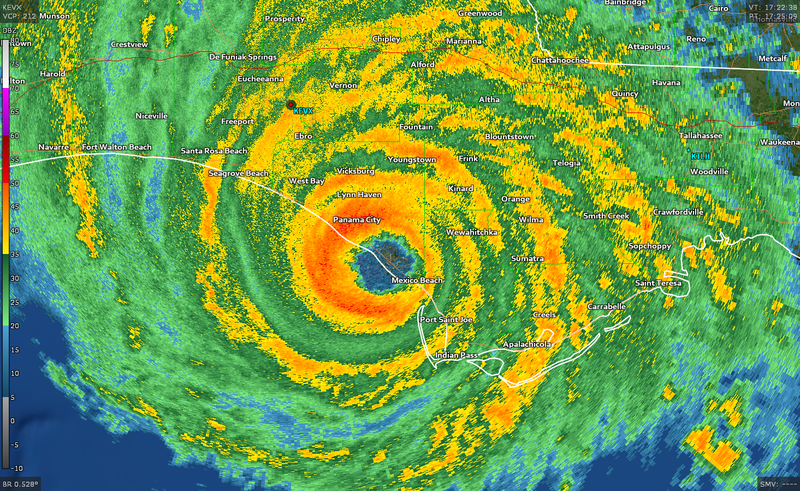 Hurricane Michael made landfall today near Panama City, Florida, with maximum sustained winds of 155 MPH. Its winds were just a few ticks short of a top-of-the-scale category five, but that doesn't matter to the folks in the path of the storm. This hurricane is an unprecedented disaster, and the pain and suffering for residents in the affected areas is only just beginning. The pictures and videos we saw of the damage from extreme winds and storm surge will only get worse as folks in the hardest-hit areas start to check in with the outside world. Why is it so hard to verify the maximum winds of a hurricane? Meteorologists have an enormous array of tools available to them to help survey the world around us. You can use advanced satellites, high-resolution Doppler weather radar, a relatively dense network of observing stations on the ground, and even data collected by airplanes, ships, buoys, and oil rigs to collect information about the strength of a hurricane. The experts at the National Hurricane Center use all of those methods to determine the intensity of a tropical cyclone leading up to and at the point of landfall. These intensity values are reevaluated at the end of the season to check for accuracy and correct for any mistakes. The above graphic shows data plotted from a reconnaissance aircraft as Michael made landfall on Wednesday afternoon. While we have all those tools available for analysis, it's hard to directly measure the strongest winds experienced at ground level. Let's start small by thinking about tornadoes for a second. We can get a decent profile of a tornado based on damage surveys conducted by meteorologists in the days after a storm. Experts surveying the path of a tornado can use damage to structures, vehicles, vegetation, and even the ground itself to estimate the winds in a tornado. We know the EF-5 tornado that tore through Joplin, Missouri, had winds stronger than 200 MPH because, not only did it simply wipe away entire neighborhoods, but it did unfathomable damage like compromising the structure of a five-story hospital and tearing away concrete parking blocks that were staked to the ground with two reinforced steel rods. We know a whole lot about tornadoes despite the fact that few of them ever directly hit a weather station. The odds of any one tornado directly hitting a weather station are astronomical due to their relatively tiny size. Even in Oklahoma, which is the most tornado-prone region in the world, only four weather stations out of more than a hundred have been struck by tornadoes in the past decade. Since hurricanes are many hundreds of times larger than tornadoes, any given landfalling storm will hit dozens of weather stations along its path. That gives us a lot of information about a storm as it comes inland, but it doesn't mean that the strongest winds in a storm will hit an unlucky anemometer. The strongest winds in a hurricane are confined to the eyewall, or the thunderstorms that wrap around the center of circulation. Even though Hurricane Michael had maximum sustained winds of 155 MPH, it doesn't mean that all of the winds in the eyewall were 155 MPH. The peak winds occur in only a very small area of the eyewall, an area that usually only covers a couple of miles of real estate. This maximum is typically located on the right side of the eyewall relative to the forward motion of the hurricane. If the hurricane is moving north, the strongest winds will occur in the eastern eyewall because the winds are flowing in the same direction as the hurricane's forward motion. 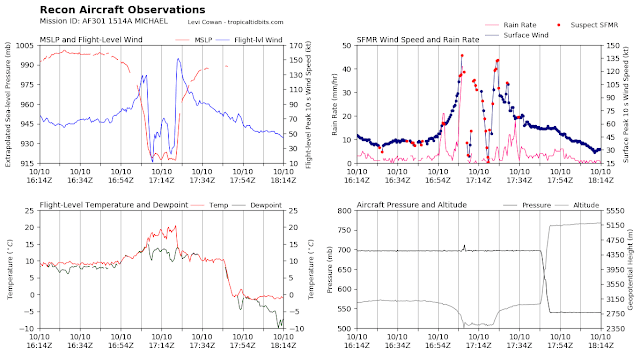 It's hard to receive direct ground confirmation of the maximum winds in a hurricane because the maximum winds only encompass a tiny portion of the overall storm, and you would have to get incredibly lucky for that small area to pass directly over a weather station with an anemometer that survives the flying debris and the sheer stress of the wind. Not even during 1992's Hurricane Andrew did a weather station directly sample the storm's maximum winds, despite the category five hurricane's eyewall striking a heavily-populated part of southern Florida, including the National Hurricane Center's own office. We've seen lots of pictures and videos of horrible damage around Panama City and Panama City Beach this evening. Tyndall Air Force Base, which fell under the northern part of the eyewall and saw sunlight as the eye passed overhead, measured a wind gust of 129 MPH during the worst of the storm. Florida State University's campus in Panama City saw a 116 MPH gust during the passage of the eyewall. Panama City and Panama City Beach were on the western eyewall. Tyndall Air Force Base was on the northern eyewall. There's so much wind damage in those areas that it looks like a bomb went off. Veteran hurricane chaser Josh Morgerman tweeted this evening that he was "literally shocked" at the scope of the damage around Panama City. But Panama City didn't even see the worst of Hurricane Michael's winds. Pictures and videos from the hardest-hit areas are hard to come by because the power is out and cell phone towers have spotty (or no) service. It'll take a couple of days to get a full idea of the damage inflicted by the hurricane's eastern eyewall. 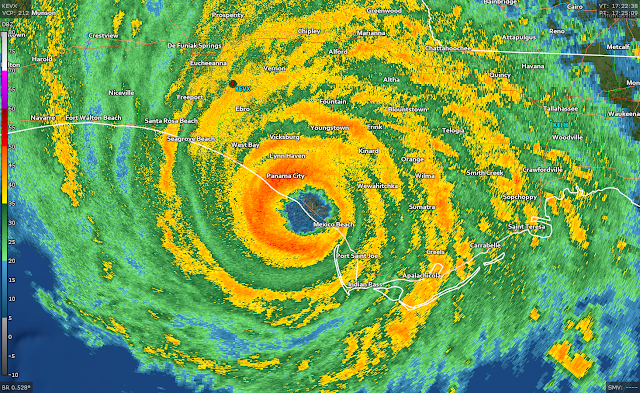 There were no readily-available weather stations in the eastern eyewall of Hurricane Michael to accurately measure the storm's strongest winds. At least, none that we know of. There could be storm chasers' anemometers or personal weather stations that were located smack in the eastern eyewall that we'll get data from in the coming days and weeks. Meteorologists will be able to use wind damage and storm surge measurements to estimate how strong the winds were as the storm came ashore. This was an unprecedented hurricane for this part of the country. The Florida Panhandle simply hasn't seen a hurricane this strong since accurate recordkeeping began in 1851. It's going to take a while to account for all the damage. It's likely that people died in the wind and storm surge. It will take years for the area to recover from the storm. But to say that it wasn't as strong as meteorologists advertised—that they purposely overinflated the numbers—based on a handful of wind reports from the northern and western eyewall is just bunk. It doesn't take direct, observed confirmation of wind speeds to know that this storm was everything they advertised and more.